The Committee for the Preservation of Thompson Street will be holding a public meeting this Tuesday, February 23, concerning the future of the historic agricultural neighborhood. Guest speakers will be Bob Bernstein and Kathy Ruhf of Land for Good, and Kathy Cavanagh of the Southeastern Massachusetts Agricultural Partnership. Discussion and refreshments will follow. The meeting is open to the public and will be held at the East Middleborough 4-H Clubhouse (the former East Middleborough School) on Thompson Street at 7.30 p.m. The Committee for the Preservation of Thompson Street is devoted to the preservation of the Thompson Street neighborhood and the quality of life it embodies. Click on the Kinsman Brothers milk cap for a slide show of Thompson Street images by photographer Greg Lessard. 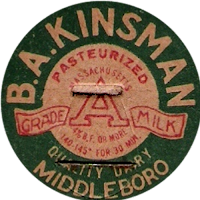 Founded by brothers Barclay A. and Dwight P. Kinsman at the start of the second decade of the 20th century, Kinsman Brothers Dairy operated an extensive dairy farm on Thompson Street in Middleborough and was one of the largest dairies locally. Later, Barclay Kinsman operated his own dairy on North Street.